Pop culture is an exciting phenomenon that connects people all over the world through a love of fictional worlds and characters. Some of the best places to experience it are comic cons, which is why I was excited to attend two in March: Liverpool Comic Con and Birmingham Comic Con. Both events were carried out back to over two weekends. I was at Liverpool Con on the 10th Match and Birmingham Con on the 17th March. Both events were different, with each being enjoyable for different reasons. Here are my thoughts on both and why I think everyone who loves pop culture should attend a comic con. The Liverpool Comic Con took place at the Liverpool Exhibition Centre. The usual one done by MCM had been cancelled, so considering that it was short notice, the new con delivered. It was smaller than I expected, but the special guests were awesome. A highlight for me was seeing my favourite wrestler, Adam ‘Edge’ Copeland, talk about his WWE career and filming on the set of Vikings. I have a lot of respect for Edge and as one of my childhood heroes it was great to see him up close. He came off as friendly, open and happy to answer questions from the crowd. Another interesting guest was Manu Bennett of Spartacus and Arrow fame, though I arrived about half way through his panel. 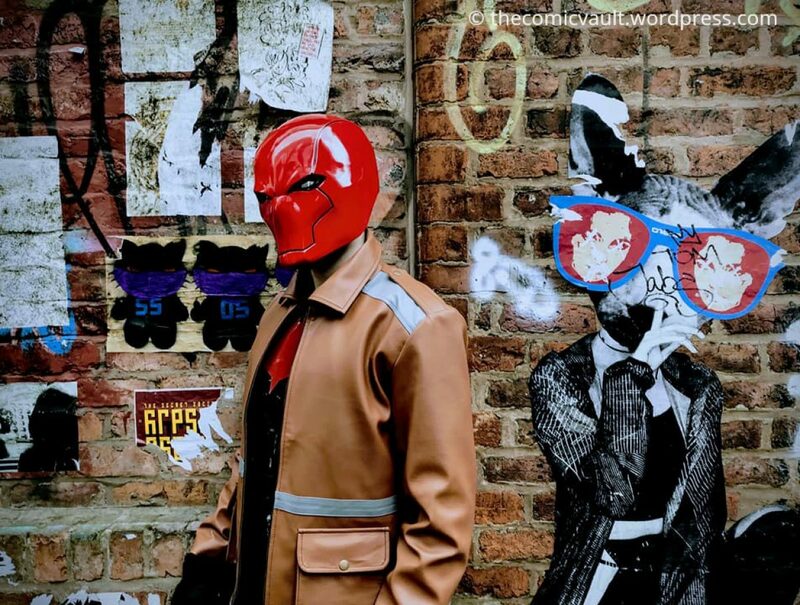 A fun part of the Liverpool Con for me was cosplaying as Red Hood and getting to meet other cosplayers. I went with a friend who dressed as Harley Quinn and it does make a difference when you’re cosplaying with someone else. The best cosplayer I ran into was a guy dressed up as Pickle Rick. It was also fun to make other connections for The Comic Vault, with an example being a photographer called Phil who runs a mental health positivity website. A important thing I’ve noticed about comic cons is how beneficial they can be for people who struggle with their mental health. Phil admitted that he was bipolar and found that attending comic cons helped to make him feel more comfortable, which I thought was refreshing to hear. The same can be said for Birmingham Comic Con, which was a lot bigger than Liverpool. There were more stalls, more special guests and a lot more hype around it. I arrived early in the morning and met a couple of other Red Hood cosplayers. I’ve noticed that he’s become a very popular character on the cosplay circuit, so it’s always great meeting people who have similar taste. My friend joined me again as Harley and she’d put the word out about a photoshoot for other DC cosplayers. Getting people together was harder than expected, but we managed to get a big group together. A highlight for me was checking out the steampunk section in preparation for the Time Quake Festival that’s happening in Manchester in a couple of weeks. I ended up buying a steampunk Iron Man statue from designer Mostly Curious Games. Both comic cons were a hell of a lot of fun and they made me appreciate pop culture more than I already do. Comic cons are the ideal place to meet like-minded people, dress up and embrace your inner geek. Yeah bro, Manu Bennett is from New Zealand!!! Cheers man. Been cosplaying for about a year now and it’s one of the most fun things I’ve ever done.